Discover one of the earliest cameras (on a super-size scale) along with mind-bending optical illusions and tricks at one of Edinburgh’s top family attractions. At the top of Edinburgh’s Royal Mile, just steps away from the Castle, is a fully interactive museum that’ll have your children bouncing with excitement. Lucy Dimbylow visited with her children Katie, six, and Tom, 12. 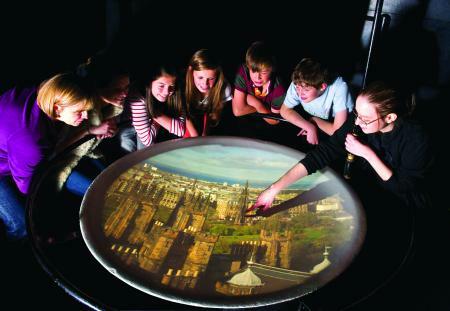 If your child is fascinated by the unexplained and can’t resist a hands-on exhibit, Edinburgh’s Camera Obscura and World of Illusions will be a guaranteed hit. Set across six floors in the heart of Edinburgh, the museum is packed with optical illusions, mind games, holograms and more… It’s a veritable Aladdin’s cave that’s worth every penny of the entrance fee. The climax of your visit is the camera obscura show on the top floor. This very early incarnation of the camera, dating back to the late 1800s, projects real-time moving images onto the viewing table through a giant periscope and is sure to capture the imagination of budding scientists. 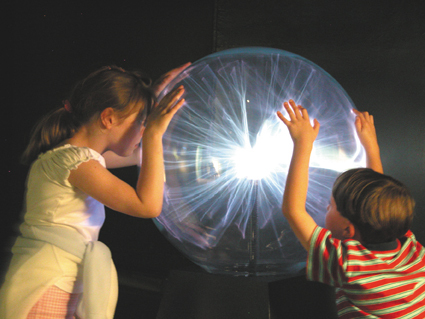 Young children will love experiencing the world from new perspectives, with a whole array of dazzling light, mirror and other optical effects to experiment with. They can hold lightning in their hand with the plasmasphere, laugh at their reflection in the hall of mirrors, marvel at the effects of the giant kaleidoscopes and lose themselves (and you!) in the mirror maze. Although the World of Illusions may seem like it’s just a bit of fun, it’ll give your KS1 a fascinating taste of how exciting physics can be. Year 2 Katie couldn’t get enough of the vortex tunnel, and must have gone through it 20 times! We loved looking at the hall of holograms and playing with fibre optics and discovering the science behind them. We also had great fun experimenting with shadow puppets and scaring ourselves with the giant holographic tarantula. Twelve-year-old Tom had just as much fun getting hands-on with the exhibits as his younger sister, but also enjoyed unpicking the whys and hows. He particularly loved spying on passers-by below using the viewcams and finding out how flick books, zoetropes and holograms work. Tom was also gripped by the camera obscura itself. You’re given a timed ticket to the presentation, and we were all captivated by this early example of technology, using a simple combination of mirrors, lenses and light to create incredible, detailed images of the city around us. Tom loved being able to ‘pick up’ and ‘squish’ the pedestrians below! The amazing views of Edinburgh from the rooftop terrace: well worth climbing the stairs for. Leave enough time to play on the way out, too: the exit stairways have lots of optical illusions and mind-bending art to look at, including famous illustrations by Leonardo da Vinci and MC Escher. There are no specific events arranged for school holidays, but there’s so much to see and explore that they’re not really necessary. If you’re visiting with pre-schoolers, check out the Teeny Tiny Toddler Fest, with activities aimed at under-fives. There are no eating or drinking facilities in the museum itself, but there’s a wide range of coffee shops, cafes and pubs within walking distance, and Princes Street Gardens, five minutes away, are a good place to picnic. 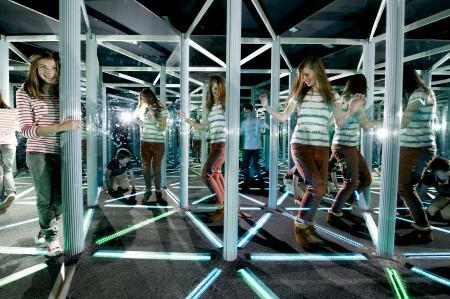 Camera Obscura and World of Illusions, Castlehill, The Royal Mile, Edinburgh, EH1 2ND. Tel 0131 226 3709. Open daily, from 9.30am; closing times vary depending on the season. The last camera obscura show begins an hour before closing, or earlier in winter as it depends on daylight. The museum is a 15-minute walk from Waverley Station. Public and open-top tour buses stop nearby, and there’s a public car park nearby on Castle Terrace. Ticket prices: £16 adults, £14 seniors and students, £12 for children (aged 5-15), under-fives free. Kids will be spoilt for choice in the gift shop, where there’s a huge range of STEM-themed souvenirs to buy, including kaleidoscopes, Newton’s cradles, astronomy kits and books, as well as the usual rubbers, badges and pencils. You can also find information about the history and science of the camera obscura online, and step-by-step instructions to make your own from the Getty Museum. Observing, asking questions and using observations to suggest answers to questions. Light, including how it is reflected and how shadows form.